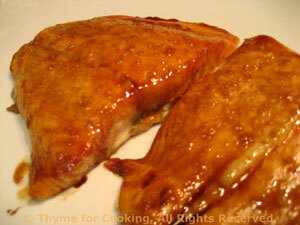 Balsamic Glazed Baked Salmon, Thyme for Cooking easy gourmet recipes. Egg Crêpes are much easier to make than the traditional crêpe using proper batter. A bit of flour makes them easy to roll up. This should use up the rest of the cauliflower from last week. An easy dinner to end the week! This is a cross between a crêpe and omelet, using more eggs than a crêpe but with the addition of flour to make it sturdier and easier to roll up than an omelet. Like both, they can be stuffed with anything. Use a light filling for a first course or something more substantial for a light lunch. Clean leek and roughly chop. Heat olive in a medium nonstick skillet . Add leek and ham; sauté until leek is tender and just starting to brown. Remove, stir in goat cheese and set aside. Whisk eggs and water well. Sprinkle flour over the top and whisk well. Melt 1 tsp butter in a medium nonstick skillet over medium heat. Add 1/2 egg mixture and cook, undisturbed, until dry on top, 3 - 5 minutes. Remove to a plate and repeat with remaining egg mixture. 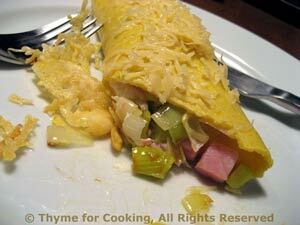 Divide leek and ham mixture in half and spread on the edge of each crêpe. Roll up and put into a baking dish. Sprinkle with cheese and bake for 10 minutes, 350F (180C), or until cheese is melted and crêpe is heated through. The honey-vinegar makes a lovely glaze with a hint of hot from the mustard. In a small sauce pan heat the vinegar, honey, mustard and oil, whisking to combine. When combined remove from heat and set aside. Put the salmon, skin side down, on a baking sheet. Bake in 400F (200C) oven for 15 - 17 minutes, depending on thickness, basting with the honey/vinegar twice more. Salmon will be done when it flakes easily, slightly pink in the center is fine. Baste a final time and serve. 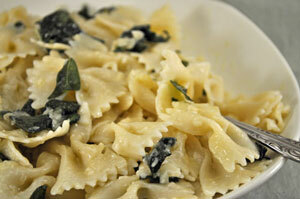 I love the fried sage leaves, and if you like sage at all, 20 leaves are not too many! In same pan, over medium low, heat olive oil. Add sage leaves and minced garlic and sauté for a few minutes. Add drained pasta, toss quickly. Remove from heat and add Parmesan and pepper. Serve. 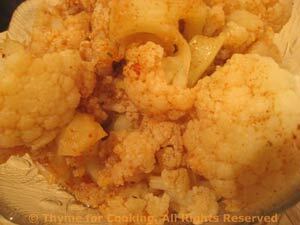 A bit of smoky paprika makes an interesting finish for cauliflower. Cut cauliflower into pieces, put in steamer and steam over water for 10 - 15 minutes until fork-tender. Put oil into same pan. Add paprika and sauté 1 minute. Add stock and heat through. Pour over cauliflower. Toss to coat and serve.